I love my husband, and I love spending time with him. He’s been retired since we moved to Jacksonville more than eight years ago. During more than five of those eight years, I worked outside of the home and Jim was my “house husband.” It was a great arrangement, and I loved it. I mean, how many wives do you know whose husbands have dinner waiting for them when they came home from work? For the last three years, however, I have worked at home, about half-time. We’ve been able to golf, go shopping, and do anything else around my flexible freelance work schedule. It has been great. And despite being together full time, we haven’t gotten on each other’s nerves (too much). As I become more “retired” (I still choke on that word), we anticipate traveling in our motorhome, and we will be spending even more face time together. But togetherness has its limits. I mean, how much can you talk about when the only other person you’ve seen all day is the one sitting next to you? I’ve always said there is more than one solution to any problem, so I found another way to listen to our library mystery—my laptop computer. Unfortunately, that did not work out, either. The speakers were not loud enough to overcome road noise. So, for the four days we were on the road, Jim and I had to resort to old-fashioned conversation and (yes) silence. As soon as we got home, Jim researched AM/FM car radios with a CD player. Baby came with one, mind you, but it did not work. So we ordered a new one, a nice Sony that even has an audio plug (so I can plug in my laptop and listen to downloaded books), and a USB port. Since the old radio had been a Sony, we thought it would be a snap to plug it in and begin listening to NPR. He tried everything, and both he and I researched the topic on the Web. To no avail. “It’s got to be something simple,” I told him. He agreed, but we couldn’t find the solution. I suggested he go across the street from the RV dealer and talk with the young fellow who owned a (very loud) car stereo shop. 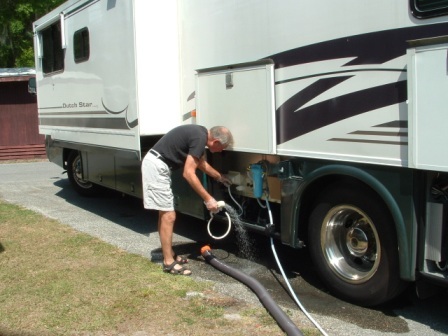 The next day, before he could make the short walk across the street, however, the shirtless stereo-shop owner with bleached blond hair and colorful tattoos running along his arms, abs, and back came over to the RV place to ask Ed for a favor. Jim happened to be there, and he told blond boy our problem. So, the next time Jim and I take Baby out (and that will be in a couple of weeks, complete with the cats), we won’t have to sit in silence any more and stare at the passing palm trees. Any suggestions for a good books-on-tape mystery? • Pack the pillows. That’s right, I forgot to take our pillows. And you know how important personal pillows are. Fortunately, I had made some decorative pillows for the bed, so we weren’t obliged to sleep without any pillows. But sleeping just wasn’t the same without the pillows we are accustomed to. • Take bathing suits. Friday, and even Saturday, we didn’t need them. 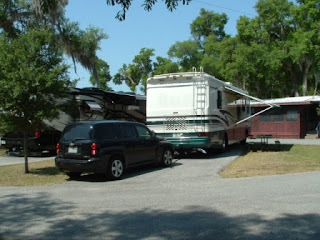 But Sunday we spent at a nice RV park on the St. Johns River. The sun beat down on us fiercely. We were cool inside our “Baby,” but I longingly looked at the large pool. After dinner, the campground cleared out. I suspect a lot of families with kids went home, or perhaps the parents just kept the kids inside after supper. We could have had the pool virtually to ourselves. But, we forgot our suits. Next time. • Stow lawn chairs in the basement. It was on my list, but somehow we forgot to load them. That’s a must. Although most campgrounds seem to have a picnic table next to the RV spot, sitting on hard planks isn’t as comfortable as reclining in a nice canvas lawn chair with a built-in footstool. • Stock the kitchen. We forgot some basics, such as dish towels, the toaster, mayonnaise (we did have mustard, though), steel wool, napkins, and a kitchen sponge. Fortunately, we had a full roll of extra-absorbent paper towels, which was a good substitute. • Pack more food. Because we didn’t want to unhitch the car, we cooked on our gas stove. I had packed enough food, but we were limited in our choices. So, next time I’ll pack more staples to increase our flexibility. • Toss in a roll of TV cable. When we were in Orlando/Kissimmee, the TVs found more than 60 stations (a lot of them in Spanish). Where we stayed our last night, we were pleasantly surprised to get about 15 stations (again, many in Spanish, and even more church-related). So, we weren’t without entertainment. But the park did have cable available. We just didn’t have any way to hook into it. Next time we’ll be prepared. • 3G is good enough. A couple of months ago, largely on a whim, we switched from ATT DSL service in our home, to Clear (clear.com). Clear is a wireless broadband provider, both for home and on-the-go usage. We purchased a bundled package, with a home modem (4G) and an on-the-go USB dongle (4G/3G). When we were in 4G range, the dongle worked well, but not consistently well enough to view videos. The 3G did not allows viewing videos, but was fast enough for my other work, such as getting to websites, checking webmail, and even uploading files. So, we made the decision to return to DSL yesterday and to purchase a prepaid 3G dongle from VirginMobile. Using that device, I will only have to pay as I need the service, and not pay a monthly charge, whether I use it or not. • Relax! That was probably the most important learning for me! It’s hard for me to take it easy, but I’m learning. I can almost (but not quite) say I am retired! I’m looking forward to our next trip, which will definitely be a real vacation. My mother used to say (and still does), “What goes around, comes around.” It’s true. Almost 45 years ago, I was married to my first husband while we were still in college. Student-poor, we applied to live in married housing at Indiana University. We were assigned the least expensive housing—a tiny 8 x 28 foot green trailer. It was so small that when I was lying in the double bed, I could touch both walls! But the rent was reasonable—as I recall, only $49 a month, utilities included. I’m getting more comfortable traveling in this fiberglass box. Jim is becoming quite adept at driving it. But don’t look for me to be behind the wheel. We left Orlando not sure where we would go. We started to head toward the coast, but decided on the spur on the moment to head toward Lake Astor, at the edge of a state forest where bear-crossing signs abound. The campground is on the St. Johns River, not far from where we rented a houseboat for our honeymoon almost seven years ago. It’s quiet, and we even went fishing. We didn’t catch anything, but we did feed a few minnows. Tomorrow it is back home. I think I am beginning to like this almost-retired life, and I’m looking forward to our next trip.